I found this beautiful idea on Pinterest! I just joined and look forward to finding some wonderful ideas in my spare time. It looks like you can do this using a heat gun or blow dryer. You could also probably do this using crayon shavings. Perhaps the child could draw a picture on watercolor paper, carstock, vellum, or make a design on wax paper, and fill it with crayon shavings and then melt away! This looks so fun, I want to try it too! Lacy over at Catholic Icing, has a great post on starting a home school co-op. Sofia Cavalletti, founder of the Catechesis of the Good Shepherd has died today in Rome. May God rest her soul. 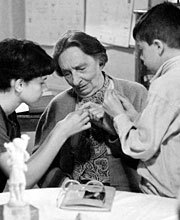 Sofia developed the Catechesis of the Good Shepherd religious formation program for children in 1954, inspired by the work of Maria Montessori.